It’s time to show you the fun we had introducing the world to my new company, aka “Jellyfish,” at the International Christian Retail Show this July in Denver, CO. First of all, you need to meet the Jellyfish team. You’ll learn more about each one of them – favorite food, superpower, etc. – in the coming weeks. But here they are! That’s me on the left, followed by Paul Conrad, Liz Thompson, and Tim Johnson. They’re also super-nice folks that are a ton of fun to work with. We’re all wearing our brand new Jellyfish t-shirts, with Liz wearing the fashionable orange & pink version. You’ll notice we’re carrying little Jellyfish bags filled with the Jellyfish postcards and buttons we passed out on the tradeshow floor. Low budget, but lots of fun. Yes, that’s who you think it is. Not Alec Baldwin… not Billy Baldwin… but Stephen Baldwin! The otherBaldwin brother! That’s him posing with Paul and Liz, plus two honorary Jellyfish that helped us work the show, Jon Reich and Eric Ronne. (Jon and Eric were once members of Big Idea’s web/interactive team, and now, along with Eric’s brother Ed, have their own company designing DVD menus and bonus features. Their new baby company is called “Ronneland,” and shares space in our little yellow house in Wheaton, IL with Jellyfish. Contact them if you have a DVD that needs designing – they did “Jonah” and all the veggie stuff.) Needless to say, we were all thrilled to get this close to a bonefied Hollywood legend. 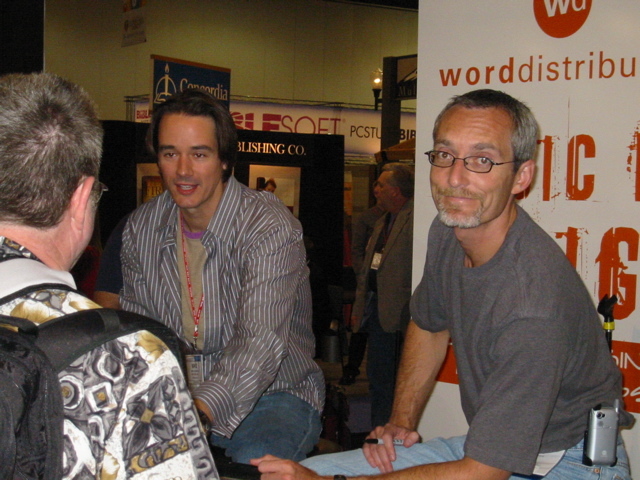 Oh… by the way, the guy on the left with the goatee is Jerry Jenkins, co-author of the “Left Behind” books. Why he and Stephen Baldwin were sitting together at a small table is too harrowing a tale to explain here. Did we work? Hoo boy – let me tell you about it. 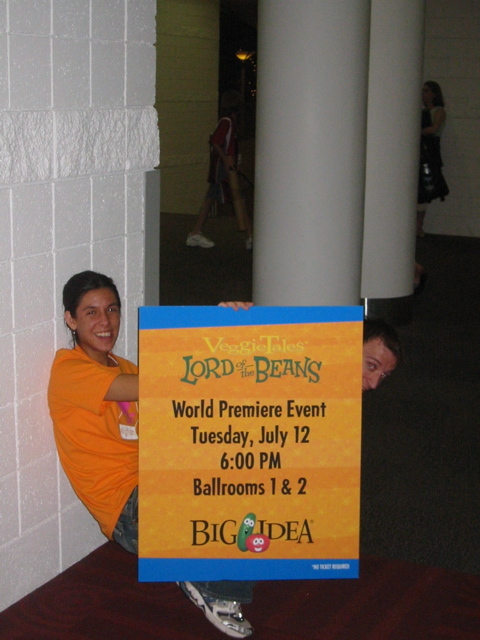 The second night of the convention Big Idea had the premier event for the Lord of the Beans. I stopped by ahead of time for the soundcheck, and while the room looked great, the setup up crew was having a bit of a problem. 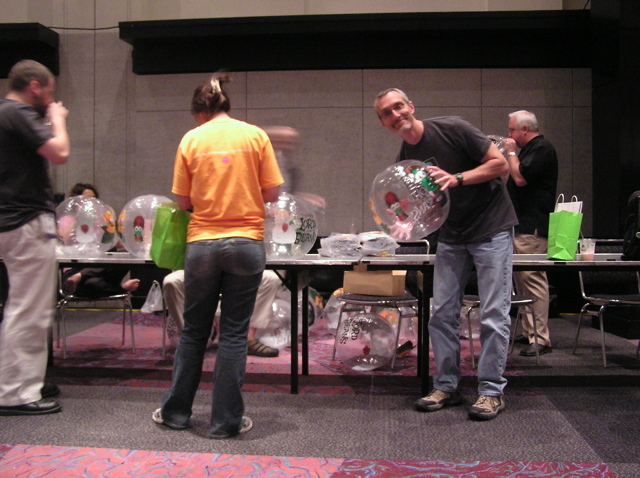 Big Idea had ordered Lord of the Beans beach balls (dubbed “bean balls”) to give away at the event, and they wanted a bunch of them blown up to throw around the room after the show. But the “bean balls” were darn hard to blow up. 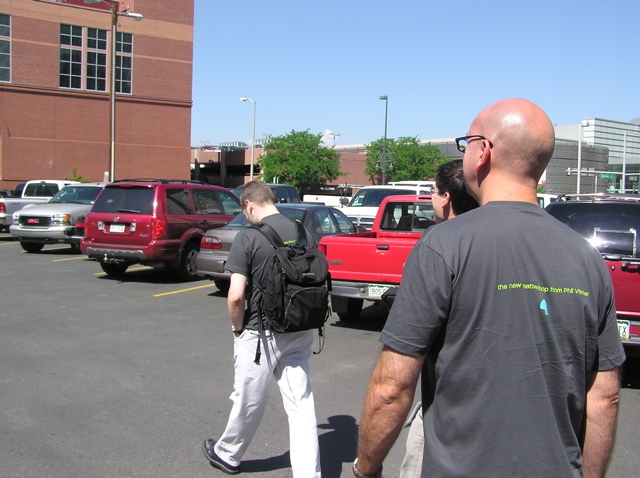 Each one took 5-10 minutes of concerted puffing, which, in Denver’s thin air, was awfully fatiguing. There was no way Big Idea’s marketing team was going to make the deadline. We all worked hard and got the bean balls blown up in time. 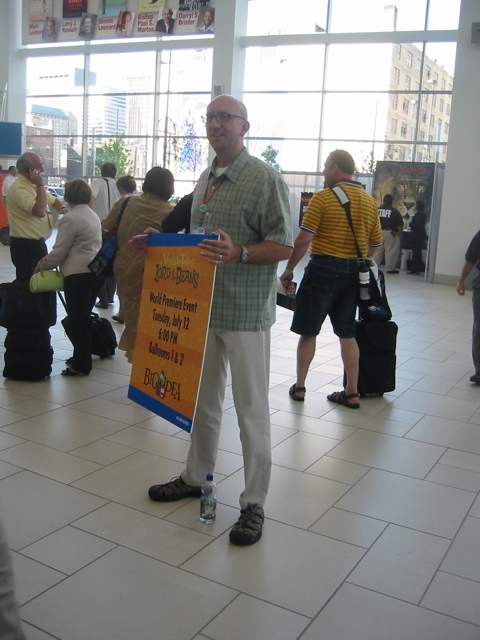 But there was another problem: Big Idea had signs to show the conventioneers the way to the event, but not enough manpower to hold them all. Once again, Team Jellyfish jumped into action! And Liz in action… with a shy Jon Reich hiding behind the sign. 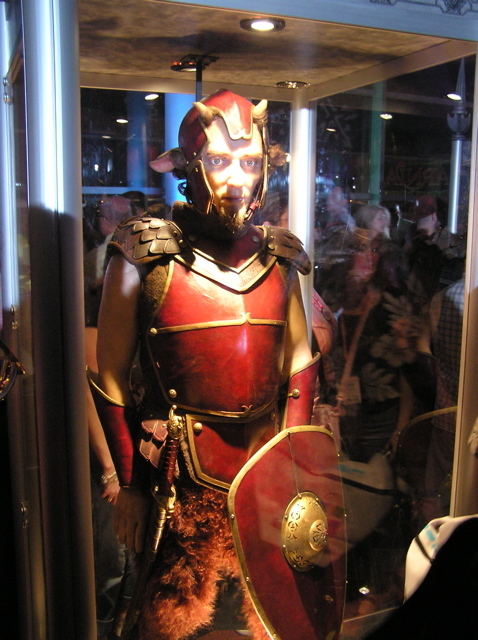 It’s easy to see that without the Jellies, the Lord of the Beans event might never have happened! I had to introduce the film, of course, which is harder than it looks. 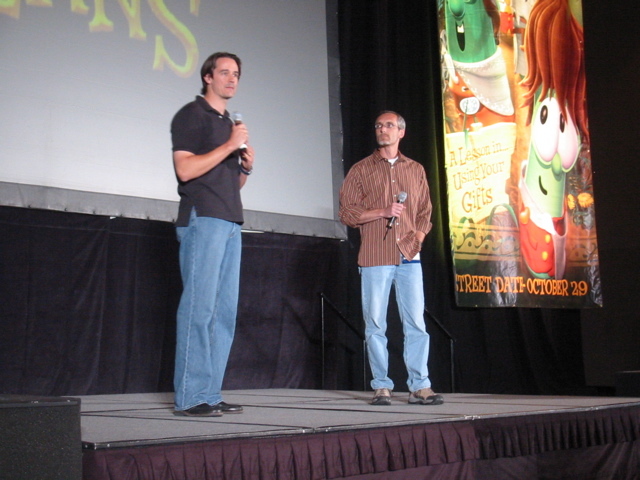 Here I am onstage with Mike Nawrocki for the big introduction. You can see how hard I’m working by the intense look of concentration on my face as I watch Mike give his part of the intro. Factor in the thin Denver air and the fact that the ballroom had very poor cellphone reception, and you begin to understand just how taxing my four-minute intro really was. Fortunately I’ve been jogging a lot lately, so I made it through my talk. As a result, nearly 800 happy Christian retailers and their kids got to see the Lord of the Beans! Hard work? You bet. Worth it? Absolutely. But my work was not yet done. 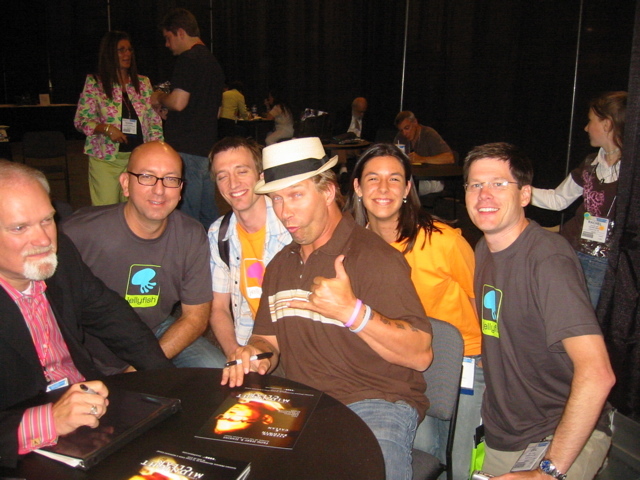 Here I am with Mike signing autographs at the Word Entertainment booth on the tradeshow floor. Again, look at the focus – the grim determination – written on our faces. Not to mention the fact that Word had given us very tall stools to sit on in front of a very low table for signing, the combination of which put us in a signing posture not unlike the position you’re asked to assume on an airplane in case of emergency landing. Sure, there was a little more oxygen with our heads down near our knees, but it was hard on our backs! Things got even dicier when a 12 year-old kid cut in line to have me sign his brand new Jellyfish postcard instead of the VeggieTales video we were supposed to be signing. Oi vey! 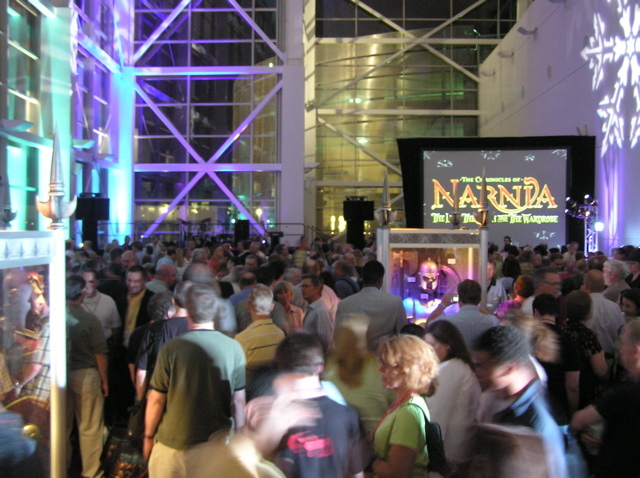 They packed about a thousand people in one of the convention center lobbies and fed them dessert and showed them some props from the film while they waited for the big event. For the event itself, a few people talked about how “big” the movie was going to be, and then – hold your breath – they showed the trailer. Off of a DVD. The same trailer I had seen on film earlier that day when I saw “War of the Worlds” in a theater. I walked away thinking, “Hmm… I guess they don’t want to reveal too much…” but then later that week, Disney went to Comic-Con in San Diego and brought out all four kids from the film plus the director via satellite. Then they showed new footage that no one had seen before. Which left me thinking, “Hmm… Hollywood likes Christians now, but not nearly as much as they like comic book fans.” Funny world. They did have one very unusual item on display at CBA, which will make almost anyone want to see a film: A faun in a box. Yep. There it is. A faun in a box. If that doesn’t make you want to see the film, there’s just something wrong with you. Given that the event was a “dessert reception,” we were all greatly relieved to see that Disney had the good sense not to serve “Turkish Delight” as a featured dessert. The same could not be said of one Narnia licensee on the show floor, though, who was, in fact, trying to interest Christian retailers in their line of licensed Narnia jewelry by handing out free samples of the White Witch’s evil dessert. We resisted the temptation, preventing Aslan from having to die all over again for our freedom. Whew! 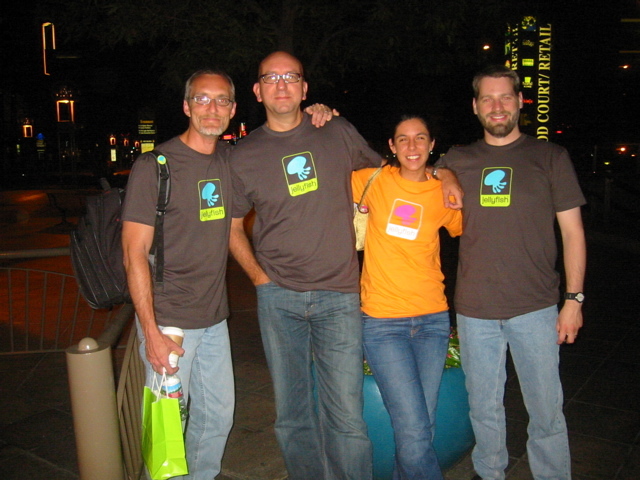 The back of the shirts said “the new Creative Shop from Phil Vischer” in lime green over a little aqua jelly logo. Very eye-catching. Here’s Jon and Tim on their way to storm the castle. 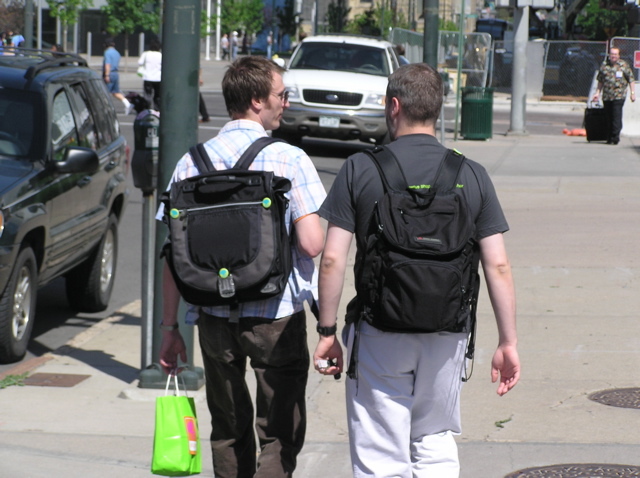 Note Jon’s jelly bag and the three jelly buttons on his backpack. 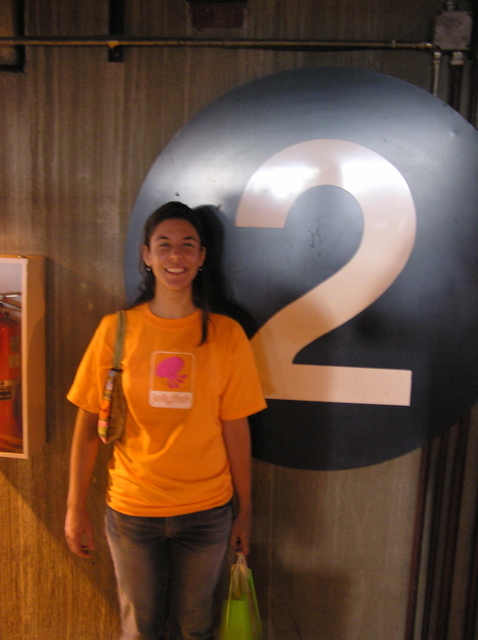 Liz, on the other hand, was the talk of the parking garage in her orange and hot pink jelly shirt. We thought the orange jelly shirts were just for girls, until day 2 of the convention, that is, when Jon showed up wearing orange! 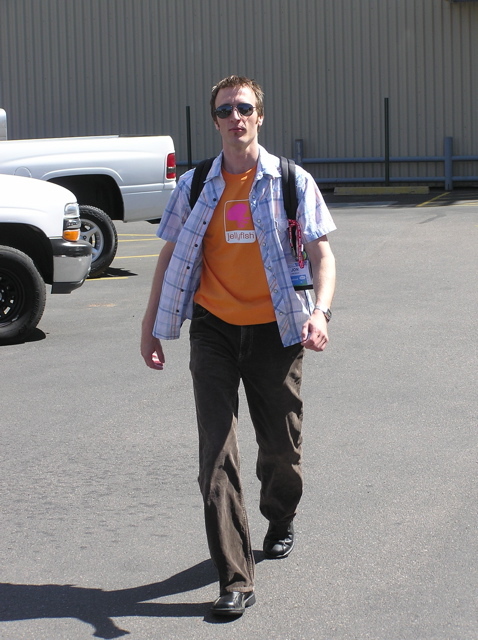 By the end of the week, Tim was also daringly wearing the orange. Stephen Baldwin even put in a request for an orange and pink jelly shirt of his own! Everyone found something to like at the International Christian Retail Show. 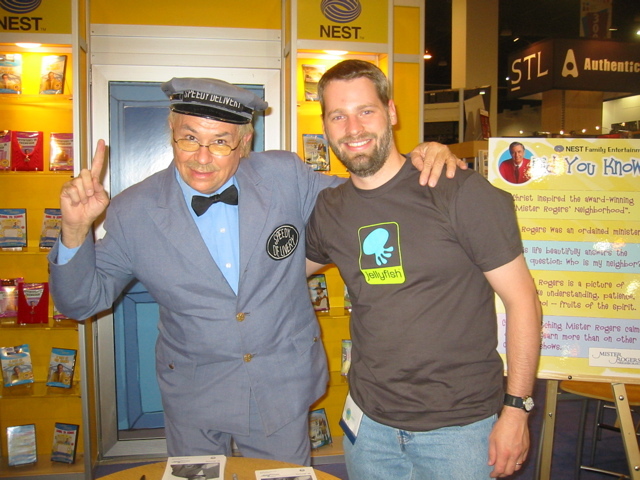 Where else in North America could you snack on Turkish Delight with Mr. McFeely and Stephen Baldwin? 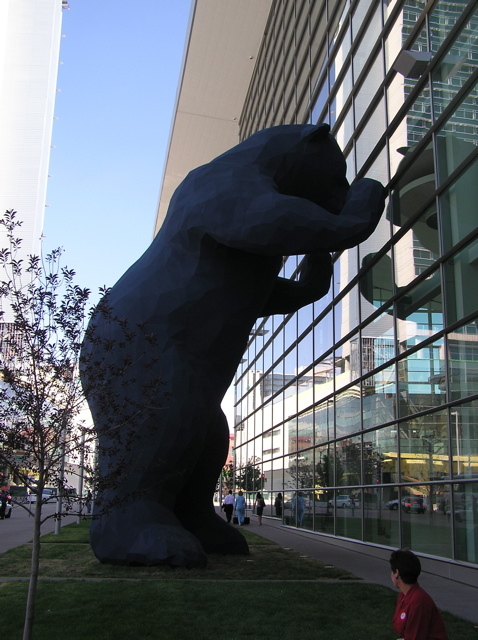 And call it a “business expense?” Even this giant, blue bear couldn’t believe what was going on inside the Denver Convention Center. In the end, a new brand was launched. The Lord of the Beans premier was a hit. 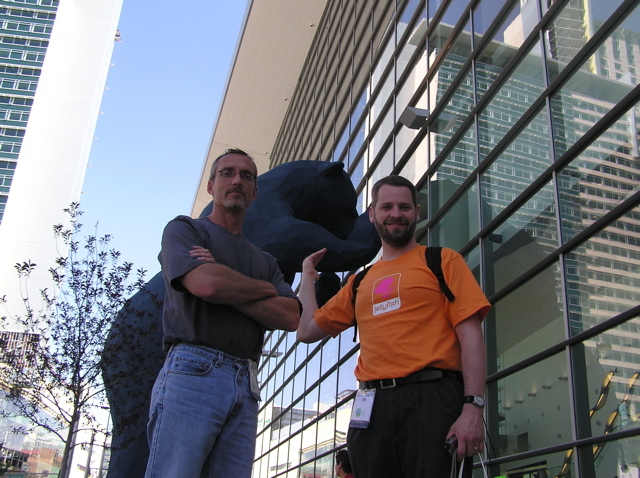 Tim and I befriended the giant blue bear, who ordered his own orange jelly shirt – in XXXXXXL. How could anything top this? 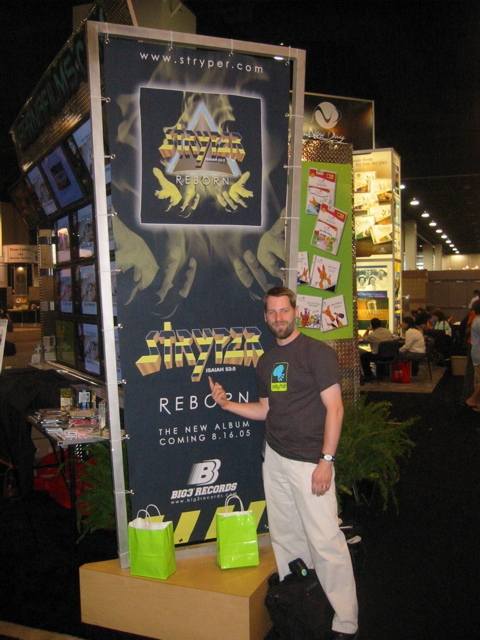 Previous“Lord of the Beans” at CBA 2005 and big news from Phil…a NEW COMPANY! Saw you on Harvest-TV recently. Totally enjoyed your “testimony” re your work-aholism and, then, learning to let-go-and-let-God. I wish I could’ve taped your words. As I pursue my dreams and thoughts, I’m wanting to make sure God’s in the picture, too, because I need his blessing, I need to know he’s rooting me on. It’s hard to tell, sometimes. I guessif there’s peace in your heart you step out in faith at that point. Didn’t know where else to put thiswithin your website, so here it is.